Do you love coloring? Do you love puzzles? Do you love dinosaurs? 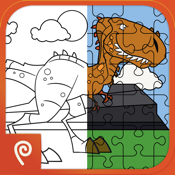 If so, Color It Puzzle It: Dinosaurs is the perfect app for you. Simply pick an image, color it as desired, and then you can turn it into a customized puzzle of your own creation.